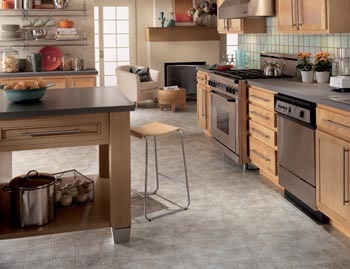 Update your home or business with vinyl flooring in Middletown, DE. Our flooring showroom offers a wide range of vinyl tile flooring, sheet, and plank flooring suitable for any area in your building. Whether you’re updating the dingy old laminate flooring in your kitchen or installing stylish new vinyl plank flooring in your dining area, we have something to suit every stylistic preference. No matter what room you’re working on, vinyl floors offer a stylish, durable, and long-lasting flooring option at great prices. After choosing your new flooring, be sure to schedule vinyl flooring installation with our team. Allowing us to install your floors means you’ll be covered by our Lifetime Installation Guarantee. This means that if you ever experience installation-related problems with a floor installed by us, we’ll make it right at our expense. When it comes to maintenance and cleaning, few materials have simpler needs than vinyl. Whether you have vinyl sheet, tile, or plank flooring, you can keep them looking and functioning great by sweeping regularly and cleaning up spills immediately with a wet towel. For more difficult messes, use a microfiber cloth and vinyl-approved, non-abrasive cleaning solution. Harsh chemicals could result in discoloration or degradation of the seals on top of your vinyl flooring. Once you’ve chosen your new floors, schedule vinyl flooring installation with a dedicated professional. Our experienced team will remove your old flooring, properly prepare the subfloor, and install your new flooring so it looks and functions great for many long years. Amateur installation could result in unevenly placed tiles, peeling vinyl layers, or even cracked vinyl leading to moisture seeping through and causing water damage to your subfloor. You never have to worry about the installation with us since we offer a Lifetime Installation Guarantee.